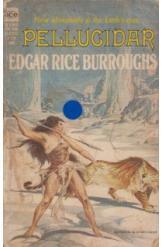 Pellucidar Edgar Rice Burroughs Sci Fi. Book is in good condition, all pages intact. Explorer David Innes is trying his best to civilize the primitive tribes who dwell in the world he discovered deep below the Earth's surface. When the local empress Dian is captured, David must abandon this task and use all of his modern science and sophistication to brave the underworld's savagery and rescue her. The first book of the Pellucidar series.